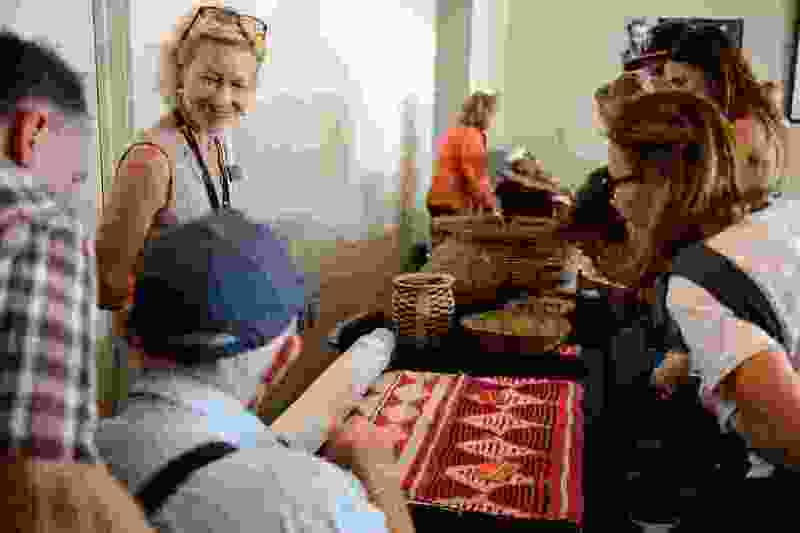 (Trent Nelson | The Salt Lake Tribune) Anne Lawlor answers questions during a one-day exhibition at the Natural History Museum of Utah showing artifacts collected by explorer and geologist John Wesley Powell during his river expeditions through Utah. Saturday Sept. 22, 2018. Nearly 150 years after John Wesley Powell led the first trips down the Colorado River, items from the explorer’s travels were on display Saturday at a one-day exhibition staged by the Natural History Museum of Utah. The pieces, including American Indian apparel and weaponry, had been stored in a closet at the Illinois university where Powell once taught. University of Utah geology professor Marjorie Chan came across the artifacts earlier this year and helped broker their transfer into the Utah museum’s collections. Saturday’s event included lectures by three Powell experts, providing insights into the significance of Powell’s voyages and how they shaped 19th-century Americans’ understanding of the Western territories. Also exhibited were American Indian artifacts collected by Frank Marion Bishop, who served as cartographer on Powell’s second expedition of 1871 and settled in southern Utah, and sepia watercolor paintings by Utah artist Dean Fausett that depict Powell’s expeditions. Fausett painted the scenes a century later, relying on the explorer’s notes for inspiration.